I have lived in central Iowa for almost my entire life. I received my education at the local community college and Iowa State University, where I earned my BA in English in 1993. In 2009, I completed my MA in Education. I have been a teacher for the last sixteen years, teaching English, social studies and special education. I raised one son, who still lives at home. I have enjoyed living on a small acreage for the last eleven years. It was the perfect place to raise a son and collect a large animal family of cats, dogs, goats, an ox and his companion cow, chickens, ducks, geese, peafowl, and a llama. This past March, I was fortunate enough to purchase the sixty-eight acres that surround me. I am now working to make my dream of being a full time farmer come true. One important aspect of my vision is to create a beautiful haven in the country for others to experience. Along with the livestock, cropland, hay, and pasture this will include an on-farm market, orchards, winery, and an events center. This blog is a chronicle of the progress, trials, and everyday events along the way. Even though I am the owner of the farm, truly my entire family is a part of making the farm run and the dream come true. I am a goat herder, a nature lover, a tree-hugger. I wonder if goats see in vivid Technicolor or if their lives are grayscale. I hear the crying of the Earth as we pollute and destroy her natural beauty. I want to spend my days surrounded by the beauty of the natural world. I pretend my animals are the teachers and ponder the lessons they would teach. I feel the love Millie has for her new born kid and her entire family circle. I touch the souls of my loved ones and know their feelings. I worry about what the world will look like in ten, fifteen, or twenty years. I cry at the thought of plants and animals being recklessly destroyed. I understand the fear of trying, the sadness of failure, and the joy of success. I say we can make amazing and wonderful things happen if we put our minds to task. I dream of soaring with eagles, swimming with fish, and running with cheetahs. I try to live a green life to inspire others to do the same. I hope we can change our destructive habits and live in harmony with our Mother Earth. Jeremy: Jeremy grew up helping on the family farm, so he has years of experience with crops and cattle. He has been hired to custom farm the crops. He also works for a tiling business and has worked in management positions in Hilton hotels. He graduated from MCC with an AA degree where he studied carpentry. This broad experience base combined with his love of talking and being social makes Jeremy a valuable asset. Brandon: Brandon grew up on the farm and has lots of experience. He is currently attending college at Iowa State University. He is part of the brain trust that generates ideas. He is great in helping research and motivate to make those ideas a reality. He is the taskmaster and organizer. He’s always there to help whether it’s outside in the fields, with the animals, or making wine. Caleb: Teresa’s son, Caleb, has been pressed into labor since they moved to the acreage and began raising animals. He helps with those two-man jobs like trimming hooves, fixing fence, and making hay. He has been working with Jeremy in the tiling business and helping his uncle farm. He graduated from DMACC in May, 2010 as a mechanic. He also provides great creativity and problem solving skills. Pauline: Pauline is the artist of the family. She is vital in many of the craft items. She is the one that taught Teresa canning, sewing, and crafting. She is always there to help with crafts, artistic endeavors of all kinds, canning, gardening, bottle feeding kids, and pitching in anywhere she is needed. James: Jim is retired from the Sheriff’s Department, but that just gives him more time to work at other things. He is experienced in carpentry, having built several houses on his own. He brings those skills to salvaging buildings, repairing buildings, and helping with all kinds of projects. He has become the chainsaw master, helping to clean up the fields and pastures. He does wood crafts and designed and built our wine rack. He is a lender of tools and financial support. Central Iowa would put you not very far from me up here in South Dakota…but I’ve only lived here for two years. I love it though! Except the mosquito’s, I hate the mosquito’s. I do think life would be better without mosquitos and flies! Thanks for stopping by. would come off as pretentious or uninspired, you carry the weight of the words solely on your life, and it works really well. I generally have a hard time with pieces that use a repeating line (just a personal preference, I’m sure), but I think it works for this one. It comes off as a refrain to your voice, like watching the wheat in a field bounce back after a breeze pushed it to the side. Very well done, thank you for the visit and thanks for posting this. Thanks so much for stopping and leaving a comment. I’m glad you enjoy. i am adding you into my blogroll teresa- feel free to add me too! An absolutely beautiful and honest expression of who you are. I got lost in your blog, your farm and everything that you live to be. Kudos to you! Awww…I am in love with your farm. The animals look very happy. You have got a very beautiful farm there. And your blog too. I’m glad they look happy; I would probably say spoiled! What a beautiful story, Teresa. I love that you are so able to live close to nature and the earth. I just happened upon your blog today, and I love it! We are on a small dairy in PA, and I’ve just started blogging this past year. We just had some fencing re-done, and our 11 year old has her heart set on a goat, so I’m looking at yours with interest! Glad you found my blog! I do think goats are the best! It sounds as if you have managed to surround yourself with lovely people. Idyllic life style. Love some of your lines which are eminently quotable. Glad to meet you and your farm-family. You have a lifestyle that can be made into a television series. Wow! Your most recent post, Kidding’ – spectacular! Thank you for stopping by. I really do love living out here and sharing my stories and pictures. Hi, I’m very impressed with your work. The world today could do with a lot of nature lovers like you. I would love to keep and live in a lovely farm like yours too. Best wishes for achieving your goals.! Thank you so much. It’s nice to hear that people enjoy what I do here. I love your blog! It looks like you have a lot going on – and that you’re well on your way to being a full-time farmer. I really like your photos, too. The goats are precious! 🙂 I think it’s great that you want to create an attractive place in the country for people to visit and witness firsthand the joys of farming/gardening/being with animals. Continued luck and success to you! Thank you. I do appreciate your visit. Well I’ve been roaming around your blog for about 30 minutes love it. We have some things in common I work with special needs children and I have a son named Caleb. I would like to live on a small farm one day. But until then I will just have to live the farm life vicariously through your blog ha ha Take care and have a great weekend! So glad you’ve enjoyed your visit. There is nothing better than life on a farm. Hope you get yours soon. Have a good school year! Great to find your blog. Hubs and I are beef farmers in north-central Missouri. We used to have dairy cattle and sheep in Ohio before we moved to Missouri in 2007. So glad you stopped by. I only have one cow, but I do love cattle. They are so sweet. I think your site is absolutely beautiful. I look forward to more posts from you, and as a fellow goat lover, large animal veterinary student, and girlfriend of an organic farmer in WI, HOORAH for getting some spectacular land and putting some wonderful animals on it! How exciting! I might have to whisper some ideas into your head to ponder as a vet. Teresa, I am so impressed. Didn’t realize what all you were doing. Wonderful job. I will visit again. Thank you so much. I appreciate the kind thought. I accidentally stumbled on your site and wanted to say hello, even though I’ve been so horrible at keeping in touch! So glad that things are going well for you and your farm seems like a terrific project. Hope those Central Iowa folks are all healthy and happy. So glad to hear from you. We are all hanging in there. Hope all is well for you! I LOVE all of this!! I am also a huge animal and nature lover! Thanks for sharing your experiences. Truly, it is my pleasure to share my experiences on the farm. You live in Iowa!!! 🙂 I wonder if you live far from me. I just moved here with my husband. We live in West Des Moines. Let me know….I’ve been looking for somewhere to get raw milk. 🙂 It’s nice to find another local blogger!! I am about an hour from W. Des Moines. Welcome to the area! I wish I could sell you milk, but I am not approved to sell my milk for human consumption. Something about the outside milking tells me they wouldn’t let me if I did ask. 🙂 There is a farmer’s market in Des Moines. I know there’s a goat dairy over in your area too. They might sell fresh milk. Hi Teresa ~~ You have a nice farm and a nice blog. It is almost like ‘coming home’ to me. I grew up on a farm in the hills in eastern Nebraska about 35 miles north of Omaha. I took voc ag in high school after I went to town (Tekamah) high school. My first two years of high school were at a country school three miles south of our home. Most days I rode my horse, Minnie, to school those two years. Once in a while I bicycled. I really thank you for sharing your farm with us. Especially the goats I enjoy reading about because we didn’t have them on our farm. We share crop rented 120 acres from my grandfather. My sister lives in eastern Iowa, in Center Point. Mrs. Jim and I are retired from the schools. That means fixed income and drastic cuts in our Social Security in Texas. Glad to hear you enjoy reading about my farm. I never had goats until about nine years ago, and I just love them. Being smaller, they are easier for me to handle than cattle. I can’t imagine life off the farm now. Your website is awesome and you sound like a wonderful person. Thanks for sharing your soap recipe. I am going to try making soap for the first time and was looking for some recipes to start with. I particularly want to make sure I get the lye to oil ratio right. I love animals and the environment, too. Keep up the good work! Thanks. I hope you soap turns out well. I haven’t been brave enough to try making my own recipe yet. The goats in the header are adorable. One of my favorite sights is watching young goats gallop and prance together. I’m a city girl but live near a university that has excellent vet and ag programs, and so I don’t have to drive far to see baby goats. What’s your favorite part of being a goat herder? I’m not sure I can say what my favorite part is. I love the miracle of birth, watching kids play, milking, seeing them happy and beautiful as adults. I just love it. Thanks. I am truly touched that you would think of me. 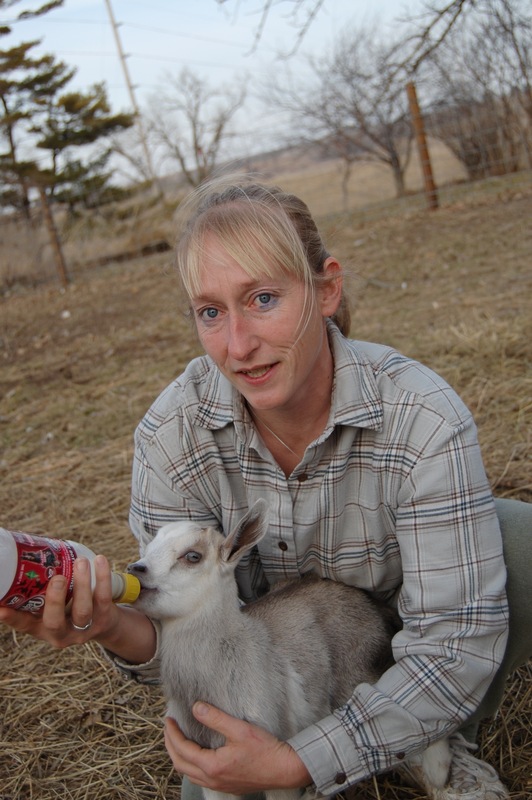 I was happy to – I enjoy reading your blog and learning all about goats! 😉 Your pictures are breathtaking. Hey Teresa, I have been reading up on your blogs since a couple days, for pure joy that they bring…I am a farmer’s daughter myself and although I live in a concrete jungle, I have a dream of owning a place like yours, over the years…so this gives me immense joy! Please keep writing! Thanks, Ajita. It’s nice to hear you are enjoying your visits! Its a wonderful experience one can ever have spending his day in the farm like you have got. especially with chickens, ducks, goats and offcourse Orchards. You are a person with the nature alive in your heart thats y you encourage the same. I wish i can also have the same if not same but still a lil bit. Anyways! Kindly try to share more pictures of where chickens, goats & ducks stay at night & in day as well. Thanks for your nice comment. I’ll have to remember your request. I’ve followed your facebook page and just realized your in iowa! I am in Illinois but am desperately wanting to return to my home state of IA. But finding a place with a small a little land for my goats is difficult. I look everyday. I hope to be back soon!!!!! Love your page. Glad you’re enjoying my farm. I wouldn’t want to live anywhere but Iowa. Hope you find a place soon. Great blog you have here. I think I will folow so I can keep up with your new posts! Glad you’ve enjoyed your visit. I do post every day. Just found your blog and love it. Tons of great info, too. I’ve got Nigerian dwarfs, FF who just kidded and we’re lovin our goats! They really are fun creatures! Glad you liked your visit. Hi Teresa, thanks for stopping by my blog. I noticed you liked my facebook page (I think that was you); I just wanted to say that I really appreciate it. You have the honour of being my first follower from wordpress! I just stopped by, and I love the images you had on there. Of course, I had to like it! I too teach English and have chickens and a duck. Your blog is one of my favorite, and I hope you see the dream of becoming a full time farmer!